Gigwalk demonstrated how a legion of iPhone-wielding (s aapl) users can become an on-demand mobile workforce for companies willing to pony up some money. Now, it’s getting $6 million to expand on its vision of matching the right mobile workers with companies like Microsoft (s msft), which are turning to Gigwalk more and more for quick mobile jobs. Gigwalk’s Series A includes funding from new investor August Capital with participation from existing investors Greylock Partners, Harrison Metal, SoftTech VC, Founder Collective, and AdMob founder Omar Hamoui. The new money, which brings funding total for the company to $7.7 million will be used to help Gigwalk build out its marketplace and improve its matching technology. Gigwalk is also going through some changes at the top with founder Ariel Seidman stepping aside as CEO. He’ll be replaced by former VP of Business Development Bob Bahramipour, who will focus on helping the company scale up its operations. Seidman is staying on as an advisor to Gigwalk. Gigwalk lets companies set up jobs for workers, who use their smartphones to collect data and send back their work. 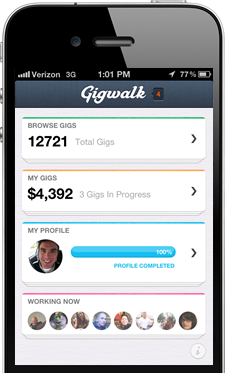 Since launching in May of 2011, Gigwalkers have completed more than 270,000 gigs. Early on, it might have been used by mapping companies looking to confirm information or fix errors. But more companies are finding different uses for Gigwalk. Microsoft last year hired tens of thousands of Gigwalkers to take panoramic 3-D pictures of businesses and restaurants for Bing Maps in ten cities. Now Microsoft is expanding its relationship with Gigwalk and will hire for 100,000 new gigs in 3,500 cities. While Gigs often involve taking a picture, many clients now send Gigwalkers to engage with consumers and ask them questions during or after they shop. That’s putting more pressure on Gigwalk to match the right employees to customers, who need skilled workers to pull off more complicated gigs. That’s what Gigwalk prides itself in: building up a smart service that takes in a lot of data from workers and matches Gigwalkers to the right job and employer. Bahramipour said 72 percent of clients are repeat customers of Gigwalk. “We’re coming at it from Google (s goog) perspective. We have data and matching technology and we’ll find you that needle in the haystack,” said Bahramipour.